The Sport-Tek® Youth PosiCharge® Tough Tee Style YST320 is available in Youth Sizes: XS-XL and it comes the following colors: Atomic Blue, Black, Dark Smoke Grey, Deep Red, Neon Green, Neon Yellow, Pink Raspberry, Silver, True Navy, True Royal, and White. SKU: SM-YST320 Categories: Activewear, Neon Pink, Neon Yellow, T-Shirts, True Navy, True Royal, Youth, Youth Active Wear, Youth Clothing, Girls Youth T-Shirts, Boys Youth T-shirts, Black, Blue, Grey, Pink, Red, White Tags: youth activewear, youth clothing, youth shirt, youth t-shirts Brands: Sport-Tek. 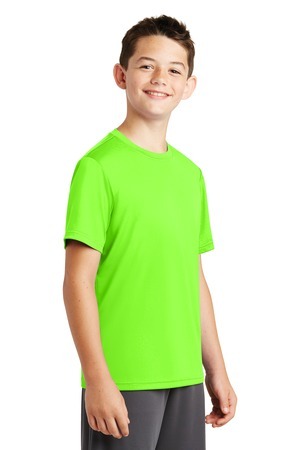 The Sport-Tek® Youth PosiCharge® Tough Tee Style YST320 is available in Youth Sizes: XS-XL and comes in the following colors: Atomic Blue, Black, Dark Smoke Grey, Deep Red, Neon Green, Neon Yellow, Pink Raspberry, Silver, True Navy, True Royal, and White. *Due to the nature of 100% polyester performance fabrics, special care must be taken throughout the screen printing process. Contact your decorator for more details. Be the first to review “Sport-Tek® Youth PosiCharge® Tough Tee Style YST320” Click here to cancel reply.